The situation cannot remain as is. One day the Middle East is bound to be demilitarized and all weapons of mass destruction will be eliminated. This will happen either in a terrible war which will be disastrous for the region's inhabitants, or due to international pressure applied by severe sanctions, or in an initiated move based on premeditation which will not only remove the threat, but will instigate a much desired change of tides, bringing peace and harmony to the Middle East. There are already several areas on earth that have been decreed WMD free (see linked map). Practical and legal experience in disarming and demilitarizing has been acquired over the past three decades. The knowledge necessary for dismantling nuclear, chemical and biological weapons exists as well as effective supervision measures. The SALT I accord has compelled Russia and the United States to reduce their nuclear weapon inventory by more than 50% and to disassemble most of their chemical weaponry in a controlled and systematic manner. Led by Hans Blix, UNESCOM has successfully overseen the disarming of the chemical warfare means Iraq had possessed, and made sure it was devoid of any nuclear capacities and that the country is WMD free. 1. There is no unilateral deterrence. Arab countries have not been misled by Israel's "vagueness". They have amassed chemical weapons, or "nuclear bombs for the poor" so to speak, that cover the entire land of Israel, whereas Israel cannot guarantee that these chemical bombs, which can kill thousands in a single bombing, will not be dropped. The deterrence is therefore mutual. The only alternative which stands to increase the security of Israeli citizens and citizens of neighboring countries is the eradication of weapons of mass destruction from the area. This is a common interest for the entire population of the region. 2. A process. In order to attain safe and secure disarming, the countries involved must participate in a gradual, long process. Therefore this viable proposal speaks of two phases. The first phase will be forming an international coalition of countries, approved of and supervised by the UN, under whose authority the disarming agreements of the region's various countries will be signed. In the second phase, the disassembling and disarming will be carried out, in practice, under appropriate supervision. 3. Definition of Middle East Zone: It is imperative to determine which countries are to be considered Middle Eastern, in order to decide which countries should join the aforementioned international coalition. As long as various organizations and countries differ in their definition for Middle East, there can be no agreement as to the counties that are to be bound by the demilitarization accord. Hence, a definition stating which countries are to be included should at least be suggested. On the other hand, any other country that deems itself eligible for entering this treaty ought to be accepted. Egypt - A country that borders Israel and holds WMD. Egypt has signed the African WMD disarming covenant – the Pelindaba Treaty. 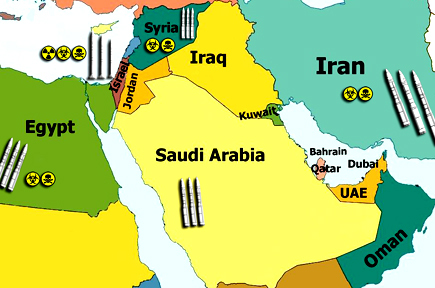 Saudi Arabia – Does not have any WMD, but has long range missiles that cover the entire area of Israel. Saudi Arabia has signed the international pacts for non-distribution of nuclear weapon. Israel – Is armed with WMD. There is no international or any civil internal mechanism that oversees Israel's weapons of mass destruction arsenal. Yemen, Oman, Abu Dhabi, Qatar and Kuwait - Are all countries in the Arab peninsula who hold no WMD. Due to their involvement in the conflict, however, they should be included in the WMD free zone. 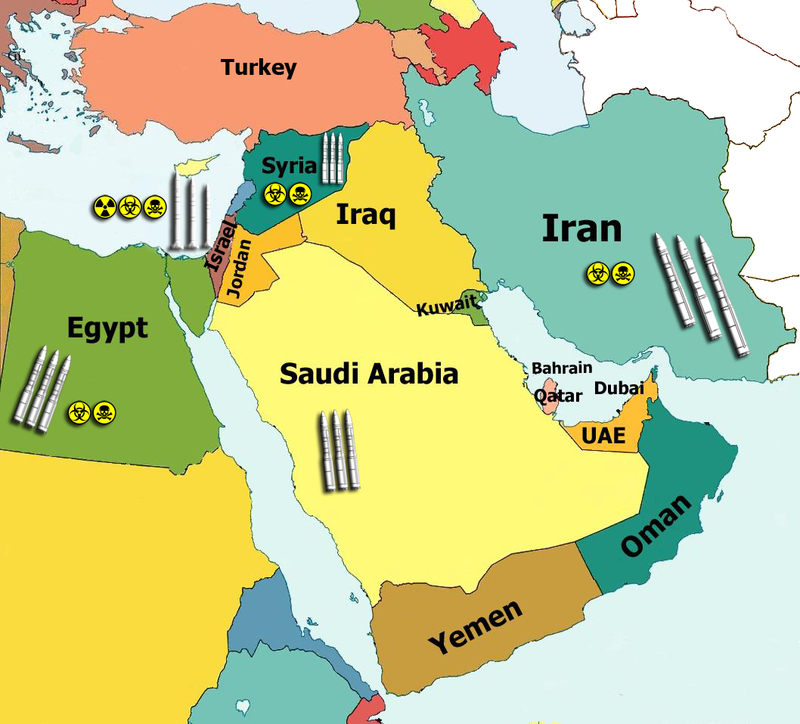 Lebanon, Syria, and Iran – Are the countries in the region that constitute part of the mutual deterrence constellation. Syria and Iran wield chemical weapons, and Lebanon, or rather the Hezbollah acting therein, can easily reach Israel with chemical-warhead artillery. Turkey – Is an integral part of the Middle East. It is a local super-power, NATO member and shares the interest to have the region demilitarized. Cyprus – Also a distinctly Middle Eastern counter, EU member, and an active constituent in the NATO layout. Cyprus has no WMD. Other countries such as Libya, Algeria and Pakistan were excluded from the list of Middle Eastern countries that are to participate in the agreement, due to the complexity of the process. It is preferable to avoid further complication by adding peripheral countries and broadening the mutual deterrence balance. The proposed list is optimal in terms of the security afforded thereby to the region's population and the practical feasibility of implementing the disarming process. 4. Israeli Prime Minister Call. The Israeli prime minister is authorized to have Israel join the demilitarization initiative. A prime minister capable of fathoming the inevitable consequences of the WMD arms race should be able to push forward a move that will cause the Israeli authorities to widely support the disarming. In fact, a decision of this nature is inherently in the hands of the prime minister and is not subject to parliament approval, just as Prime Minister Begin decided to bomb the nuclear reactor in Iraq despite objections by the heads of MOSSAD and IDF Intelligence. Since Israel has excess conventional and non-conventional military might, and since demilitarization is clearly highly desirable from the Israeli point of view, it must take several actions concurrently. A. The Israeli prime minister appoints a public official, who is not part of Israel's defense array, to be in charge of the planning and execution of the feat. A small team of various government and defense forces institutions personnel is assembled. B. Israel notifies the US, the EU, Russia and China of the initiative, the succession of actions Israel wishes to lead and the UN assist it to bring it about. This should be accomplished within one month, in a joint campaign embarked on by the prime minister and the minister of defense. C. An Israeli team prepares for contriving the plan for disassembling the weapons, and workers are assigned to the various facilities where the work would be done. Since the WMD budget would substantially decrease owing to the demilitarization, the surplus will be used for having the employees retrained in other fields of industry. A financial framework for the plants' disassembly and the retraining of workers is to be set up. The retraining will commence on the third month of the process, and will continue for several years. It is vital that the employees be explained that their retaining is a necessity brought about by social and technological changes like the ones that had occurred in the textile industry and in agriculture. These worker's skills can be redirected towards new industries that are now developed, some of which are in fact located in the Soreq and Negev nuclear research centers and elsewhere. This is feasible and must be implemented over a relatively long time. D. Two or three month after the process is started, once the prime minister and his staff finish their excursions abroad, the first publicly announced action will be taken. Israel declares its intention to start a process of stripping the Middle East from all weapons of mass destruction, nuclear, chemical, biological or other. In that announcement, Israel will also call for a meeting with regional country leaders, as listed above, and to convene as Demilitarization Congress. It also announces cessation of activity in the Dimona reactor and allows the IAEA to perform an audit to confirm its shutdown. [At this stage Israel will be able to shut the reactor down without jeopardizing its security, since it has enough bombs whose average lifespan is greater than 100 years - uranium bombs like the one dropped on Hiroshima – and some shorter lived enriched lithium plutonium bombs. Merely closing the center will take more than a year. Israel would be more secure, having the world backing its initiative]. E. Action teams from the listed countries hold meetings and set a date for the congregation of the Demilitarization Congress where the disassembly and disarming agreements will be signed. The teams will be assisted by experts from those international organizations that have handled such matters before. The teams will draw various agreements and practical joint frameworks. One of the institutions to be formed by the Demilitarization Congress, for example, will be a committee for actual disassembly and disarming headed by a competent international public figure. At the Demilitarization Congress, the big powers, NATO and UN institutions will sign agreements guaranteeing security for all the region's countries throughout the implementation of the disarming process, including fixed current financing for the execution of the disassembling weapons and disarming. At the Demilitarization Congress, countries will sign a new international treaty that aggregates and binds together all the non-distribution international accords, such as the NPT, CWC, BTWC, CTBT, forming a single unified pact. There will be no distinction between nuclear, chemical, biological or any other kind of WMD. The Demilitarization Congress will, in effect, bestow, to all nations of the world, a uniform agreement that applies to all WMD – A Disarming Agreement. The Demilitarization Congress will also set a date for commencing the disarming in practice, as by its various phases as contrived by the various committees, no later than 6 months thereafter. The actual disarming and disassembly committee will begin helping all the region's countries to prepare for the actual disarming. Second phase duration: 26 – 30 months. A. At this time, six months after the Demilitarization Congress, the participating countries will submit all information they have regarding WMD layouts, including all inventory, material, equipment and storage specifications of the weapons they possess to a sub-committee of the actual disassembly and disarming committee. This disclosure of information is meant to enable to evaluate and devise courses of action for reciprocal disassembly and disarming by all participating countries. B. The actual disarming committee, made up of representatives from all listed Middle Eastern countries, helped by the guaranteeing countries and organizations, procures the means necessary for locating and designating all sites of material or facilities to be used for disassembly and disposal. The actual disarming committee will be responsible for controlling and maintaining these sites. C. Special work groups delegated by the disarming committee begin a controlled process of disassembly and disposal. Transferring the sites to the disarming committee control should take about three months. Simultaneously, active supervision units are deployed and employed by the disarming committee in all the countries involved. D. The disassembling workers execute the disarming and disassembly in the aforementioned sites until all weapons and warfare materials therein are dismantled. This should take between 12 and 18 months. Some of these sites will remain closed for decades thereafter, or even more. It is important to mention that as soon as the disarming is instigated, the terrible danger will be lifted from over our heads, and the mere initiative would inspire hope for a comprehensive and fundamentally sustainable peace in the region. This will encourage all its inhabitants, especially Israelis and Palestinians, to strive for an all inclusive appropriate resolution of the conflict. Since day one, this move will brighten global forecasts, and the wheels of trade and economy systems would be jolted into motion with renewed vigor. The Israeli economy, for one, will benefit from saving 1.5 billion USD in its current budget, that is 14 to 15 percent of its national security budget. Meanwhile, a highly professional workforce will join its new industries. Social-economic momentum stems from a society's optimistic view of its near and far future. Demilitarizing the Middle East will remove a grave threat and induce true hope, new thriving, and the possibility to open the entire Middle East for free trade. The current reality is just one possibility, it is not inevitable. Disarming the region is possible and we must demand of our leaders to be bold and wise and begin this process now.